I understand that I haven’t given a lot of information on Selkie’s other language, so I just wanna make sure it’s stated that “B-Barrat” is not literally spelled that way; it’s a stammer. The actual word is “barra”. The “t” makes it pluralized. … I’m not digging the new hair. Anyway, I liked the comic, and the part where she speaks her own language is about as touching as it can be when I have no clue what she’s saying. You’ve gotten very good at expressions, especially considering your art isn’t exactly detailed, but expressions are mostly in the eyes anyway and you don’t need much detail for that. Loved the joke about the drawing. I know we’ve been on the same day for a long time now, but that say was months ago, right? so…does he still have that drawing? The only thing I can say is that french braids can look weird when one doesn’t have external ears. but it still looks half decent on Selkie. Selkie’s hair reminds me a great deal of Mrs. Haversham-Zhang. Then again, Selkie’s hair tends to hang more limply and slightly shrink in volume when she’s less than happy; this could be an extreme version of that motif, given what she’s saying. You’re going to wait until the first book is published and then include all the translations, thus FORCING us to buy it, right!?! NOOOOO! Please, not the book-only dialog reveal! I love making languages:) Tee hee! I can feel your glee, Dave! Lovely fan art. Makes me imagine what Todd will feel the first time he lets Selkie swim in the ocean, or any large body of water… will she come back? You’re doing a great job of showing the beginning of their domestic life. Todd’s parents are great additions to the cast; their reactions to Selkie are entertaining and believable. Oh, good point! Traditional selkies didn’t come back once they got in the water… Is this set near a coast? It’s set in a fictitious city in Wisconsin. Yep, set in a ficticious city in a ficticious State. In order to get to Wisconsin you need to go through the Wardrobe under the bridge to Terabiothia. Great fanart and I have to agree that the french braids look a little off. She looks cute but I think because of the lack of external ears it shows a little to much of the face and forehead. I think it would look really nice if she had a braid down the sides right around the temples then bridge back to the base of the head. WI is about as far from the ocean as you can get, although there’s the great lakes on north and east and the Mississippi west. Two sets of … brows? And no external ears. Interesting! I think the lower ones are the crease of her upper eyelids, actually. Her, uh, epicanthic folds? Is that what they’re called? I didn’t realize it would look like she had two brows… ._. I may have to stealth-fix that later. But ya, it’s meant to be half-closed eyelids. Out of curiosity… are you completely winging Selkiese or have you checked out tools like the Language Construction Kit?? I’m basically winging it, but I’m keeping a growing “dictionary” as I develop/make up more words for consistency. I bought the book and it’s worth way more than it costs. I’m a Holly Lisle fan and didn’t know she had a series of books about writing. I might have to pick them up. One, because I’m trying to be a decent writer and two, because it looks like a good way to support her. Good to know that Selkie’s tongue has at least a bit of thought put into it. I’m one of those guys who enjoys fantasy languages, regardless of how strange. That last bit of interaction between Todd and Theo was nice :). On a sad note…does “barrat tae basa’ nichei” mean something along the lines of “We will always be together?” I’m shooting in the dark on guessing. It does not, but that’s a good guess. I’m with the others, looking forward to finding out more about Selkie’s native tongue. Selkie certainly does look different with the braided hair. She’s so … sad looking and introspective right now that it changes the impact. Though I must say she looks more sophisticated with her hair that way, rather than her usual “adorable” look. Oh! And congratulations on now being published in multiple languages! That is excellent news! 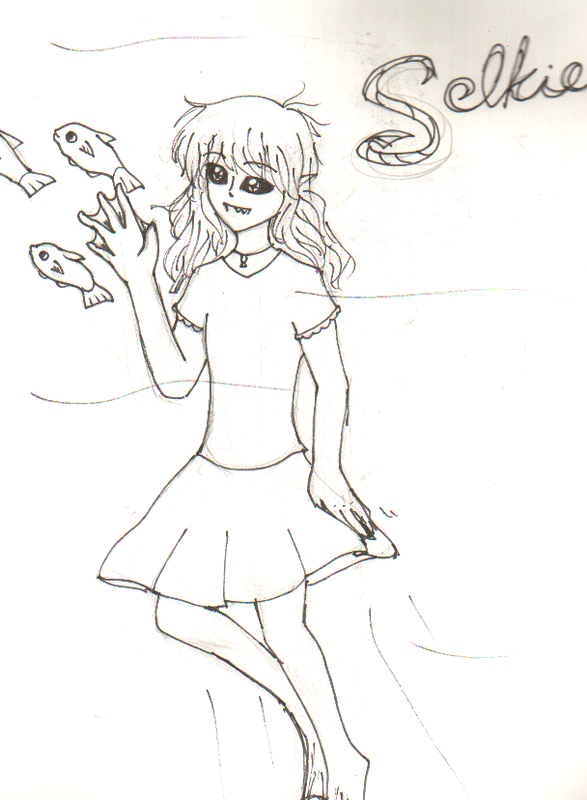 Mhm, donno If its related, but I’m drawing the first couple pages of Selkie for an art project! Want to know if its OK. Bit late in the update cycle to ask, and this may have been covered before that I missed, but your mentioning the native-tounge stutter has me wondering what her accent actually sounds like. Obviously she adds a lot of “s”s to the ends of words, but since everything else is spelled straightforward I’ve mentally been reading with a relatively flat accent. Which of course probably isn’t the case–what’s the official word on what she’s supposed to sound like? This is an interesting question, because I don’t actually have an official stance on her accent. Back when I first started the comic my mental voice for Selkie was slightly husky and a little bit raspy, but over time (and no doubt as small details have evolved) that same mental voice is more of an average little girl’s voice. As far as accent is concerned though, my thinking is that since she spent three years of her early, formative life in the orphanage, any accent she had has been mostly conditioned away over time. Except for the over-pluralizing of course.